A lot is written about the changing shape of the GB power market, with increasing decentralisation, and a shift away from large units of synchronous generation to more dispersed often intermittent renewable generation. Rather less is written about the changing commercial environment on the retail side of the business. The proposed merger of the retail supply businesses of SSE and npower provides is just the latest move in an on-going re-organisation of the market. 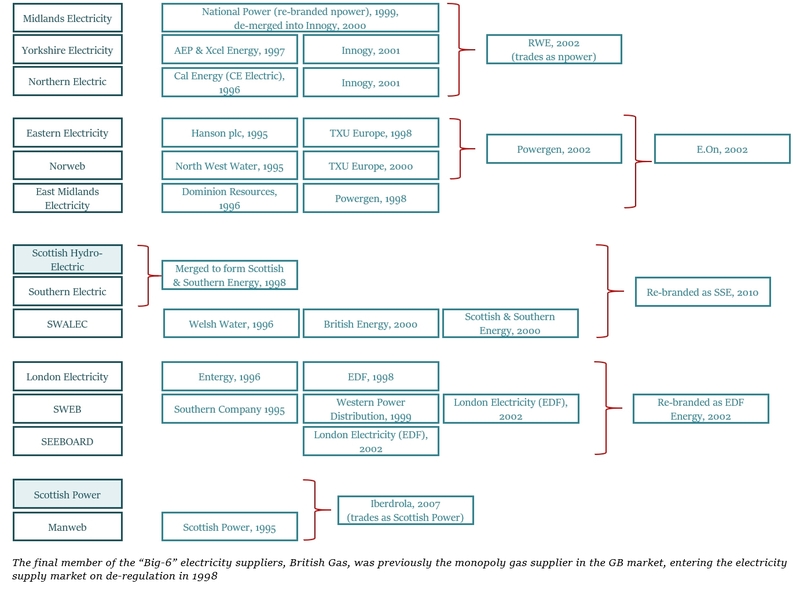 Following the Second World War, the UK had some 560 electricity suppliers, of which approximately one-third were privately owned. The Electricity Act of 1947 saw a re-organisation and re-nationalisation of the electricity industry in England, Wales and south of Scotland, and the creation of the British Electricity Authority (“BEA”), a public corporation responsible for the generation and transmission of electricity, as well as the policy and finances of the supply industry. The Act also created 14 regional electricity boards each a separate public corporation responsible for the distribution and retail of electricity in its region. The Electricity Reorganisation (Scotland) Act 1954 established the independent south of Scotland Electricity Board from the two Scottish area boards and the BEA’s two Scottish generating divisions. Like the Hydro-Electric Board, the SSEB was responsible for all three functions of generation, transmission and distribution. At this time, the BEA was renamed the Central Electricity Authority (“CEA”). Through the Electricity Act of 1957 the CEA was replaced by two new statutory bodies – the Central Electricity Generating Board (“CEGB”) and the Electricity Council. The CEGB owned and operated the transmission system and the generating stations in England and Wales and was responsible for the bulk supply of electricity to the 12 area boards in England and Wales. 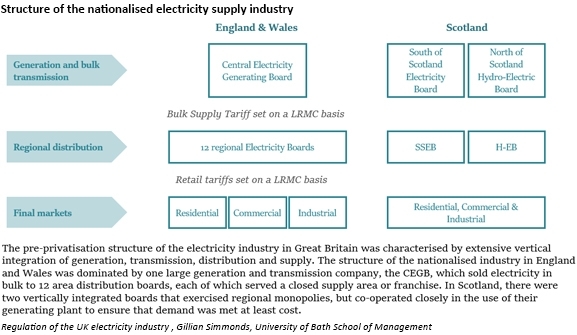 The area boards enjoyed greater autonomy, particularly in financial matters, and continued to have responsibility for the distribution and retail of electricity in their respective areas, with the Electricity Council exercising a co-ordinating role across the industry. A series of regional consumer committees was established – the electricity consumer’s committees – to replace the electricity consultative councils. The key reform was the unbundling of some of the vertical integration, to allow the introduction of competition. The RECs were established as integrated distributors and suppliers and were also allowed limited involvement in generation of up to 15% of their sales volume. National Power and Powergen were also allowed to supply to some customers directly. In Scotland, the SSEB and the Hydro-Electric Board were replaced by ScottishPower and Scottish Hydro-Electric (which merged with Southern Electric in 1998 to become Scottish and Southern Energy). Nuclear generation was assigned to a separate company, Scottish Nuclear, which became part of British Energy in 1996. In Scotland, vertical integration was maintained in the new structure. The 12 RECs in England and Wales, Powergen, National Power, ScottishPower and Scottish Hydro-Electric were sold by public flotation on the stock market. On 11 December 1990, the 12 RECs were floated on the London Stock Exchange. This was followed, on 12 March 1991, by the flotation of National Power and Powergen, with 60% of the shares of each sold. The government sold its remaining 40% of the shares of Powergen and National Power in March 1995, retaining a special share. On 18 June 1991, Scottish Hydro-Electric and ScottishPower were floated. At this stage, the two nuclear companies, Nuclear Electric and Scottish Nuclear, remained in public ownership. The National Grid Company was floated on the stock market in 1995, becoming independent of the RECs. Before flotation, the pumped storage business was transferred to a new company, First Hydro, which was then sold to US generator, Edison Mission Energy. 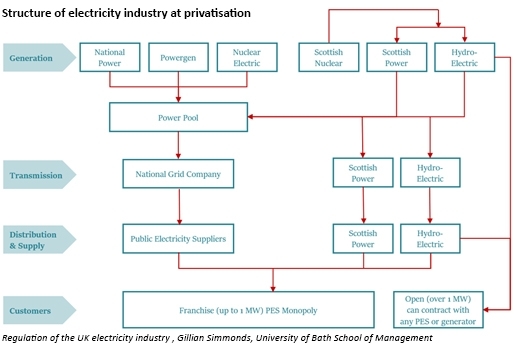 In 1990, there were six major power producers in Great Britain – National Power, Powergen and Nuclear Electric in England and Wales; and ScottishPower, Scottish Hydro-Electric and Scottish Nuclear in Scotland. The first independent power generation projects, all CCGTs, were backed by RECs who participated on a joint venture basis with long term agreements to purchase the off-take from the plants. However, the RECs were only allowed to meet 15% of their demand through own generation. Eastern Group was the only REC which obtained consent to relax this limit and took 100% control of two medium size CCGT power stations. A number of new players also entered the generation market, including US-based power producers AES, Edison Mission Energy, NRG, Entergy and Enron. National Power (Innogy) and Powergen were required to divest 4 GW and 2 GW (around 9% of capacity) respectively. By July 1996, both generators sold plant to Eastern Electricity, making it the fourth largest generator with a share of around 9.5%. In 1999, the two generators agreed to divest a further 4 GW of coal-fired capacity each in order to obtain regulatory consent for the purchase of REC businesses. Edison Mission Energy bought Fiddler’s Ferry and Ferrybridge from Powergen, and subsequently sold them to AEP Energy Services in 2001. In 2004 both plants were sold to SSE. AES acquired Drax from National Power, but was forced to give up ownership to its creditors in 2003. In 2000 National Power sold Eggborough to British Energy and Killingholme gas-fired station to NRG Energy Inc. When NRG fell into financial difficulties, Killinghome was taken over by a consortium of banks before being sold to Centrica in 2004. The sale of these stations was part of a de-merger by National Power to create two separate companies, Innogy and International Power. Powergen also divested Cottam Power Station to London Electricity in 2000. 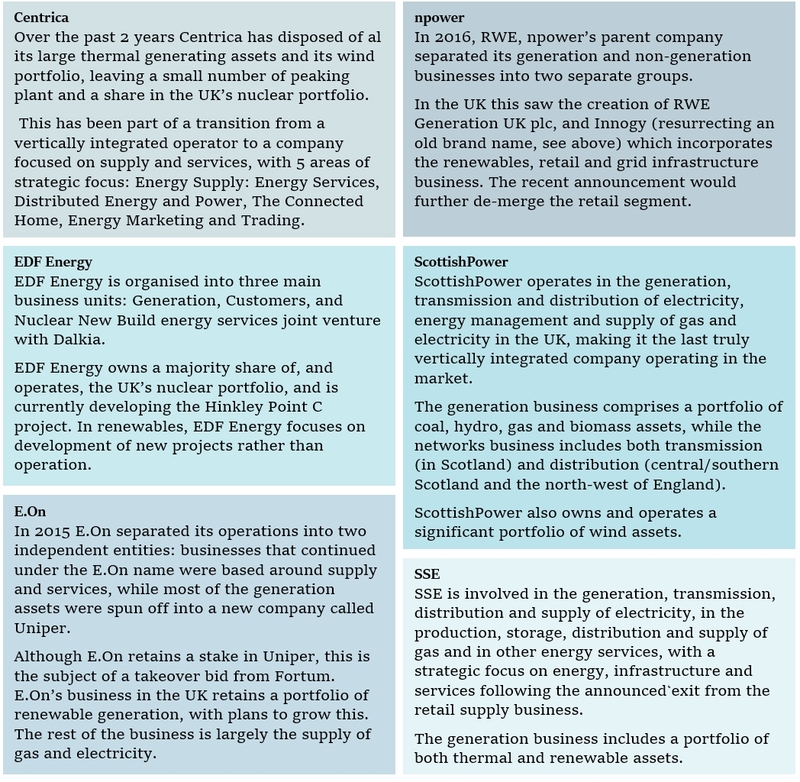 Also in 2000 EDF, owner of London Electricity, entered the UK generation market buying the Sutton Bridge CCGT from Enron and then Cottam from Powergen. In 2001, EDF purchased West Burton from TXU Europe, establishing itself as one of the major players UK generation market. In 2009, EDF bought British Energy, which had been created from the Nuclear Electric and Scottish Nuclear. 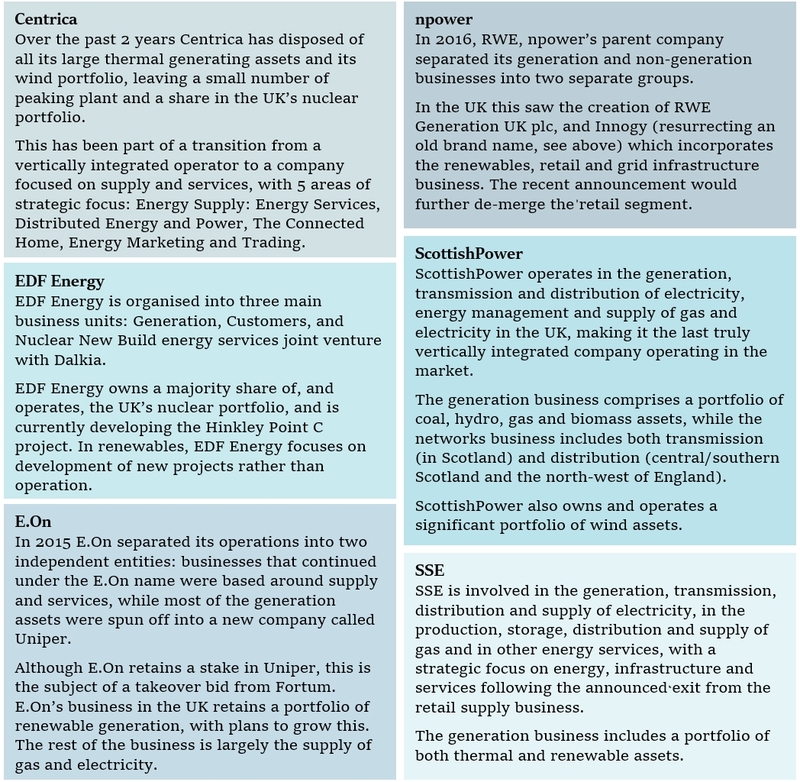 Centrica entered the generation market, purchasing a 60% stake in Humber Power in May 2001 and acquiring TXU’s two CCGTs on 20-year leases in June 2001. The supply market was opened up to competition in three phases, culminating in May 1999 when all consumers became eligible to choose their suppliers. Almost immediately, consumers in the industrial and commercial market segment began to shop around for their supply. Switching in the domestic market also got off to a good start, with former PESs losing an average of 30% of the customers in their local areas by October 2001. However, by the end of 2002 the market had seen significant consolidation, and the “Big 6” had emerged. With generation assets also changing hands during this period, the market settled into a structure dominated by these six largely vertically integrated businesses, undermining one of the key objectives of privatisation. The Utilities Act 2000 reformed the regulatory framework for the market. The director general of electricity supply was replaced by a regulatory board, the Gas and Electricity Markets Authority, which was given wider powers. A single GB-wide licence was introduced for all suppliers, and the Act also required the separation of the former PES electricity supply and electricity distribution businesses, making distribution to become a separately licensed activity. 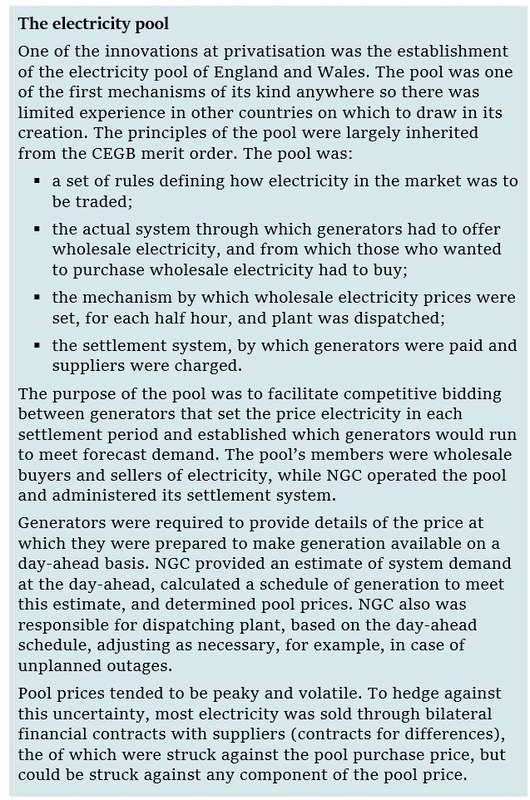 New electricity trading arrangements (imaginatively known as “NETA”) were introduced to replace the electricity pool, in response to a number of problems that had arisen over the decade of the pool’s operation. The main issues related to price formation and a lack of price competition since significant volumes of electricity were being sold on long-term contracts between a small number of players. Prices had also been open to manipulation and there were insufficient interactions between the gas and electricity markets. trading closer to delivery – under NETA, trading continued up to 3.5 hours ahead of real time, allowing market participants greater opportunity to tailor their contracted position to match their physical position (under the pool, offers were made between 19 and 43 hours ahead of real time). After the first year of NETA’s operation, the gate closure time was moved to 1 hour before delivery. In 2005 NETA was extended to include Scotland and re-named BETTA – the British Electricity Trading and Transmission Arrangements. Since the emergence of the Big 6 so soon after privatisation, there have been increasing concerns about market power, culminating in the Competition and Markets Authority review of 2016 which found that consumers have been over-paying for their energy to the tune of £1.4 billion per year. I have challenged these figures before however, the reality is that for one reason or another, the perception has arisen that the Big 6 suppliers hold positions of market power to the material detriment of consumers. But there have been a number of different corporate actions by the Big 6 over the past couple of years that has fundamentally changed the nature of the Big 6: they are now very much less vertically integrated than the have been for the past 15 years. The financial performance of the Big 6 has been weak in recent years, prompting these actions, and undermining the arguments around market power. Centrica’s share price fell 6.5% during Theresa May’s speech to the Conservative Party conference where she promised to introduce energy price caps – its lowest level for 5 years – while SSE, the only other listed utility saw its shares fall 3.4%. Centrica saw its profits fall 4% in 2016, although customer numbers held steady. Scottish Power’s profits fell sharply last year, driven by poor performance in the retail arm which saw significant customer losses, while SSE’s profits were also down reflecting weakness in both the network and retail division where customer numbers also fell. EDE Energy has also been shedding customers, causing its profits to fall by more than a quarter, with low wholesale prices and the drop in Sterling also contributing. npower made an operating loss in 2016, also losing customers, although its results were actually up on the previous year. E.On bucked the trend, posting profit growth in the last year, despite losing 600,000 customers. Against this backdrop comes the announcement that SSE and npower intend to spin off and merge their supply businesses into a single, independent supply company. This is the most significant corporate action affecting the sector since the mergers in the early years of privatisation. SSE currently has a 14% share of the domestic supply market, and npower 9%, while in gas SSE has 11% and npower 8%. In terms of customer numbers, SSE has around 7.7 million customers, and npower 5.1 million meaning the combined entity would rival British Gas for customer numbers. The proposed merger will see the new entity exceed 25% electricity market share in the six home regions of the two suppliers, and is highly likely to be referred to the Competition & Markets Authority for approval. “I see some commentators attaching significance to price caps as a driver in this scenario, though the drivers for me a much wider. The customer supply-side of the industry has become a very tough place to do business – both commercially and from the point of you of delivering brilliant customer outcomes. Both SSE and npower have had challenges, with service levels in npower holding them back for some time and subsequent restructures proving difficult to execute. SSE, known for a better level of service, has experienced challenges given the constraints of a cumbersome legacy systems infrastructure. Both, it is clear, need significant investment, focus and pointing towards the radically different energy market of the future. Taking all of this together, it is tempting to conclude that energy policy in relation to the retail segment is based on an out-of-date assumption that the market is being dominated by 6 large, vertically integrated companies who use their dominant market position to stifle competition. It’s hard to reconcile this with the declining profits, declining market shares and corporate re-organisations. The market is changing, and so are the players. Whether this new tie-up receives competition approval or not, the changes are well underway, and while the names may be broadly the same, the business they describe, increasingly, are not.